We spend our lives thinking that what touch, hear, smell, taste and, most of all, what we see is reality. I know what I saw. Ron Moultrie Saunders has spent the last decade of his artistic career debunking these myths. He uses the camera to extend our vision, exploring the nature of things with alternate eyes. For Ron, this is introspective work. After losing both parents within two years, his photography, which had been more “outward looking”, transitioned and became more “inward looking”. He began to use photography more as a way to think about his place in this world, as opposed to a way to chronicle the world around him. 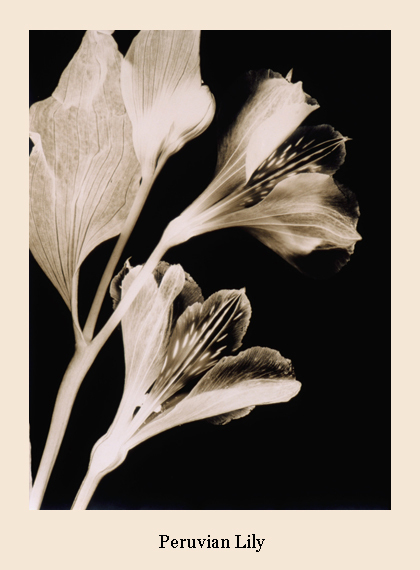 With plants, the photograms expose their inner architecture. He calls the series: “The Secret Life of Plants” and it is an on-going project. He ventures into uncharted territories. And, like the physical explorers of earlier times, it is not just about seeing what is out there. Exploration is as much about the explorer as it is about the object of the exploration. Ron attended the University of Pennsylvania, graduating with a degree in Landscape Design in 1996. 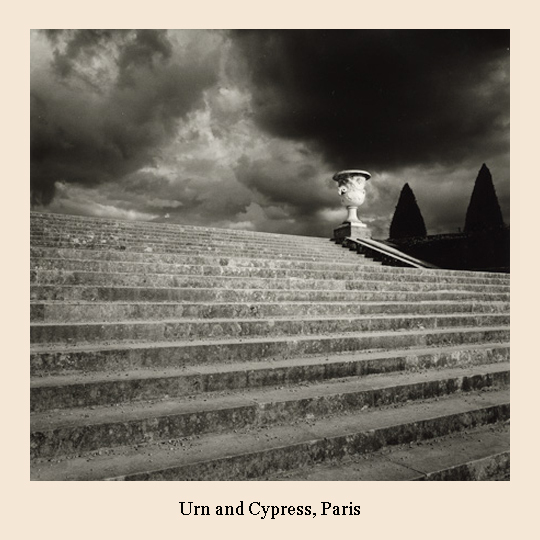 His early work was very much informed by his design career with his photography focused on landscapes and travel. In 2000, after his parents passed away, he began volunteering with children in the classroom as an art educator. 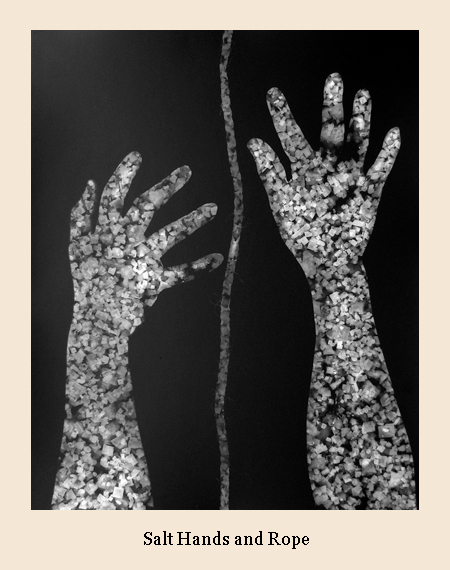 It was there that he started experimenting with photograms. It was a fun art activity for the kids. For him, however, the process was transfixing. 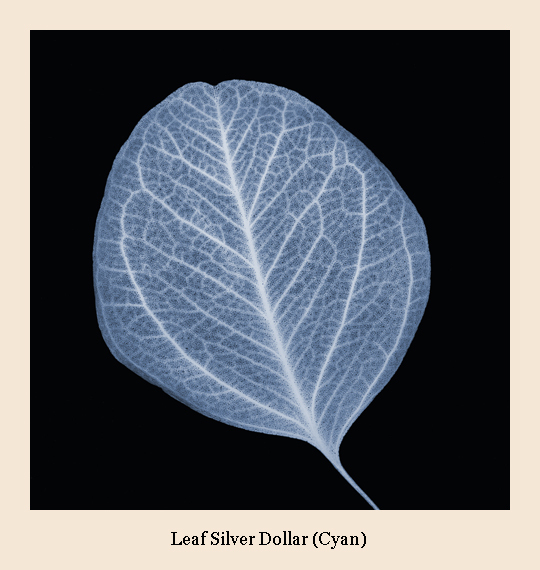 The way that light worked in photograms captured “an indescribable beauty and magic that exists in nature and within us”. He described to me a photogram of a strawberry flower. The petal was white and the light went right through it in an almost gelatinous way; then, the tiny little hairs on the stems came out. The smallest, unnoticed details can move into the spotlight. It is not just seeing in an alternate view – it is, for Ron, re-envisioning. Photograms are essentially a camera-less photographic process. Objects are placed directly on the photo paper. An enlarger is the light source. A shadow of the object is captured. Then, since the object is white where the light did not go through to the photo paper and black where it passed through; that image is reversed using the initial image as a negative in a darkroom. The work is experimental. Chance is embraced. Unexpected results are, in many ways, the most revealing. And, unlike many photographic processes, the feedback is immediate. One gratifying side effect of his work with plants has been that it has inspired people to become more aware of what is around them. Friends are always bringing him interesting things to “photogram”. One of his favorite gifts was oak leaves that had been partially eaten. 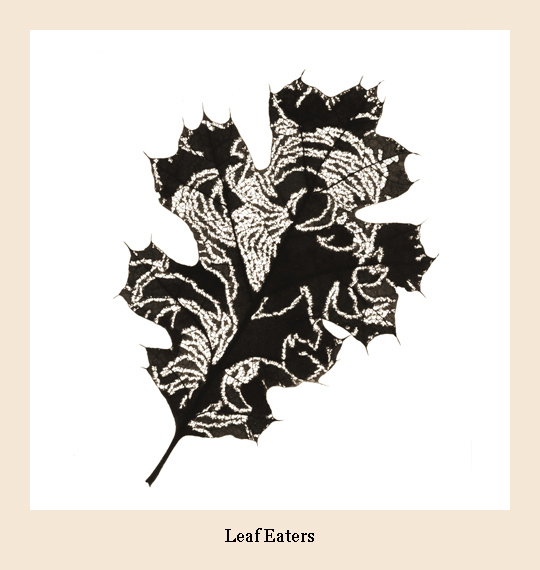 People think he made the patterns, but the patterns were, in fact, made by leaf eaters. Ron is one of the artists featured in an exhibition at Arc Gallery opening this week. The exhibition is titled: “FourSquared”. As the name implies, there are 16 artists in the exhibition, each of whom was asked to produce 16 works. It is a constrained format. All the works must be small (12”x12” or smaller). The works must hang together coherently, but also work individually. For the exhibition, Ron has created 16 images of insects, plants, fruits and vegetables. 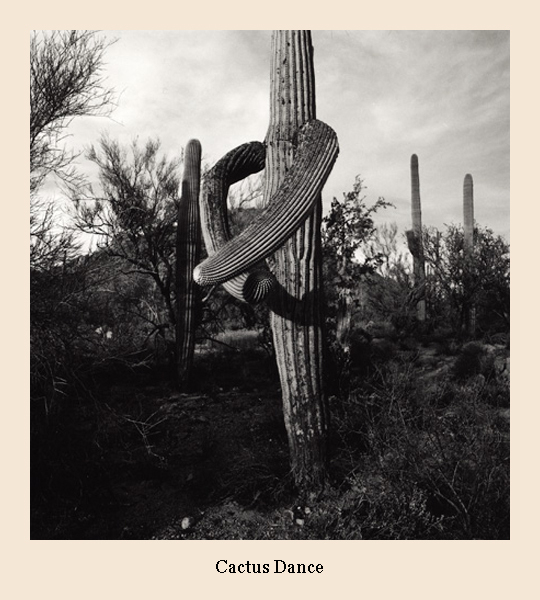 In addition to continuing with his photogram experimentation, this exhibition has further inspired Ron to experiment with alternative printing, as well. The works are printed on bamboo. Ron has also had several recent exhibitions of a new “body” of work (literally). Ron has been placing himself directly on the paper. This series is called “Someday We’ll All Be Free”. It has been a way to document his heritage and culture. He utilizes his own body, various objects and the natural world to “symbolize his thoughts, feelings, and his place in the world as a Black American male”. I often lead these artist profiles with an image of the artist working in his studio. The image that leads this article is definitely that. 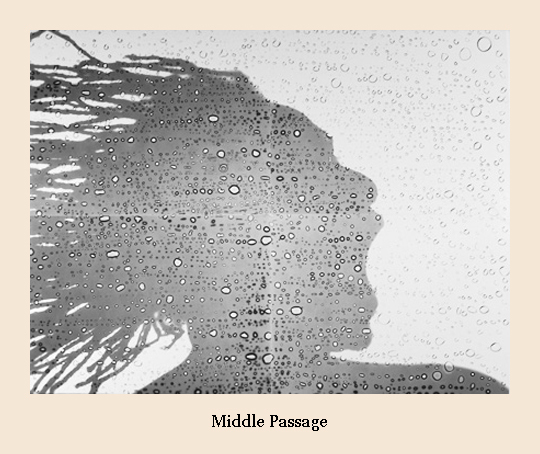 “Middle Passage” is a work that was made by placing his own head on the glass laid over the photo paper. He created a sense of motion by sweeping his hair over the glass. And, the unexpected result of using the glass as an intermediary surface was tiny bubbles on the surface, almost as if he was swimming under water. The name, “Middle Passage” refers to the passage over the Atlantic Ocean where slaves were transported from Africa to America. Many perished and were disposed of at sea. The work is one part of his very personal exploration of his history. You can see Ron Moultrie Saunder’s work on display at Arc Gallery from August 25th – September 22nd. To arrange a studio visit or to see additional work, please contact Corden Potts Gallery here. D espite Lauren DiCioccio’s relative youth, “what a long, strange trip it’s been” seems apropos. An eclectic mix of life’s side alleys and back roads have informed and transformed her art. She has both sought and embraced opportunity at every turn. Shortly after graduating from Colgate University a decade ago, she decided to travel, making ends meet with itinerant employment along the way. Off she went to Sydney, where a chance posting lead her to hitch a ride into the Australian Outback. She worked as a short order cook at the end of a long and dusty road. I cannot help but hear refrains of Jevetta Steele’s “Calling You” from the movie, “Bagdhad Café” rattling around my brain. Much like a character from that movie, she is both social and not. The isolated existence was a low-cost, contemplative place to make art. Quiet interludes offered the opportunity to focus on abstract paintings that, at that time, continued the work she had been doing at university. Twice weekly all of the local residents would gather to share newspapers, letters and other news, albeit slightly time warped. Thus, the café offered socializing as well on a limited basis. When she returned to the States, she began a requisite job search. Once again, an “outside the box” opportunity appeared and off she went to spend six years as a resident manager at the Djerassi Resident Artists Program. It was another job that embraced the yin-yang of her social and hermit natures. Djerassi, which is located in Woodside, is definitely down a back road; with no television and very limited internet. There was, however, a rotating cast of resident artists. 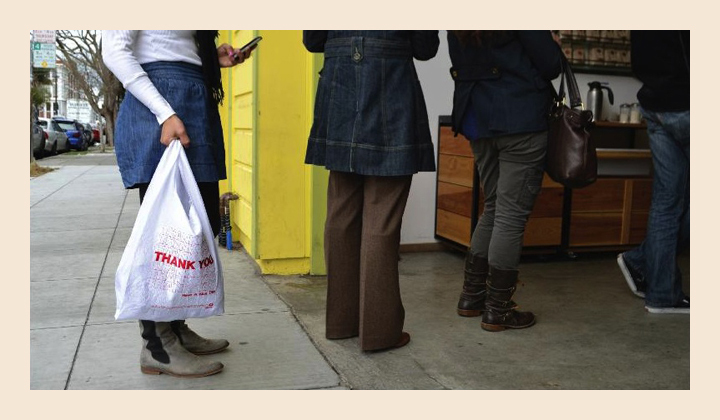 Here, like in the Outback, the arrival of mail and the newspaper was a call to socialize. The newspaper, in particular, became a touch point with the outside world – in a way defining her relationship with it. She was drawn to employ it physically in her art. She started by using the newspapers to make a quilt. This was the major turning point in her work. Her art became more physical. It detoured into an exploration of materials that were being being used. The materials that appealed were materials with a particular transient quality. Not only were the materials ephemeral, in and of themselves; they were also representative of a transience in our world; a world where we transition away from books and newspapers and slides and plastic bags. 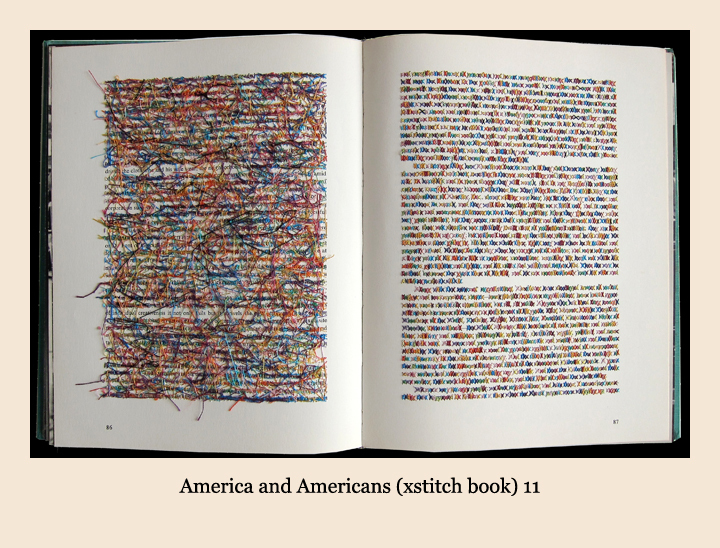 Initially she would transform the materials, beautifully embroidering newspapers that were destined to decay. 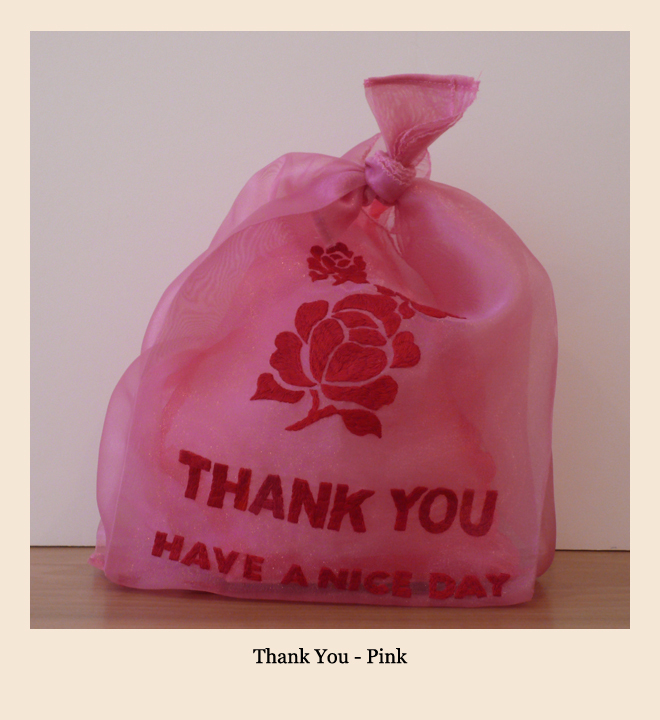 Later, she began to meticulously reproduce the objects, in the tradition of trompe l’oeil; objects like her Chinese take-out “Thank you” plastic bags, replicated in bridal organza embroidered with silk thread. She took books and embroidered over the letters on the page, using color-coding to create a secret language; presciently forecasting a time when the letters themselves will likely fade into a secret language accessible only to a small cast of scholars. Like trompe l’oeil, with Lauren’s work, what you see is not necessarily what you get. Lauren is a collector. However, in a life lived out of a suitcase, physically collecting objects is not really feasible. So her collections are not collections in a box or drawer. Rather they are collections of memories. There is a nostalgic, wistful quality to those memories. With Lauren’s art, the process of remembering how things used to be distills them into something more profound. The current exhibition at Jack Fischer Gallery is an amazing opportunity to see yet another turn in her road. The familiar objects are there. 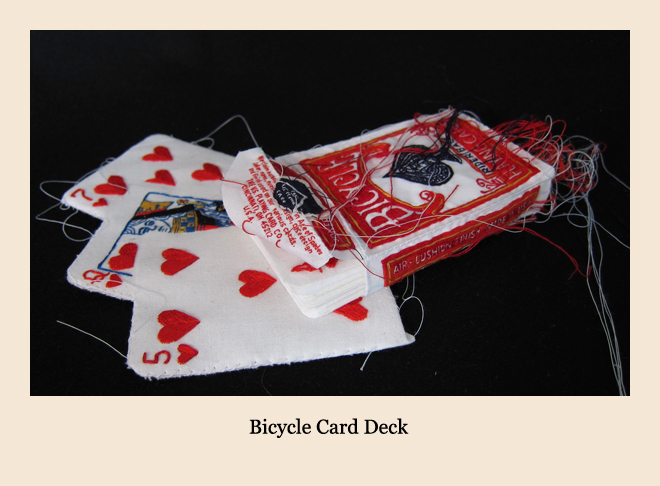 There are the trompe l’oeil objects: playing cards and U.S. currency in various denominations. There is a collection of color-coded books. Then, the exhibition detours with some wonderful new surprises. There are embroidered pages of sheet music and recipes. These are indirectly explorations of our senses. They explore the yin-yang of “sense” deferred then realized. The objects are encoded sensory journeys where, once de-coded, the sound, smell and taste leap off the pages. There is also a collection of white mice and rabbits that been eviscerated. The appeal here is a yin-yang exploration of cute and grotesque. The separate explorations intersect with a particularly important piece: “Cookbook with Braised Veal Heart”. In dissecting her eviscerated rabbits and mice, Lauren pulled out the organs as separate works. These are not anatomically correct organs; rather they are what she feels the organs should look like. 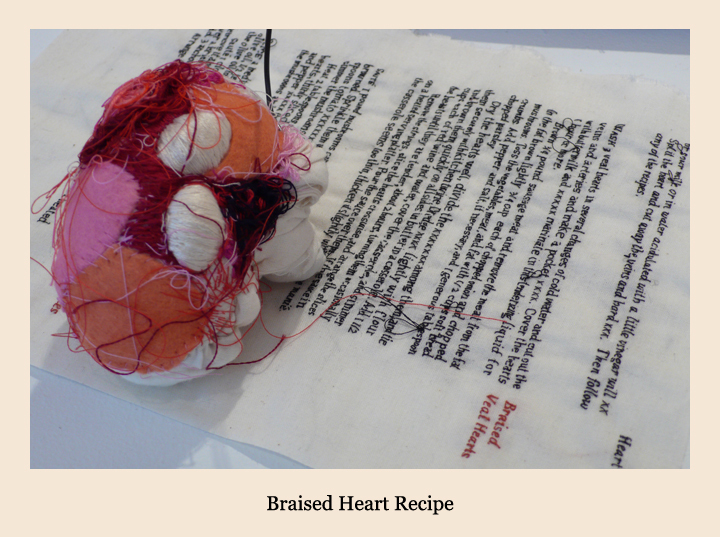 When she pulled out (created) a veal heart, she decided to combine it with a cookbook page containing a recipe for braising the heart. It is one of the most powerful pieces in the exhibition. And, while many of the pieces in the show are available separately, Jack Fischer explained to me that Lauren felt strongly that this was a singular piece and that it needed to stay together. One cannot help but agree. It was the creation of these fantasy internal organs that led her back to her roots in abstract art. As she was fashioning the organs, her subconscious would take over. 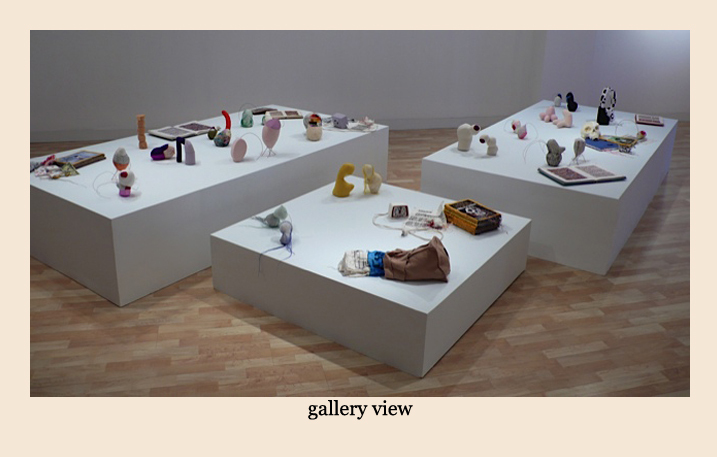 Objects took form of their own accord – representing no specific real world objects. She and I agreed that it was almost like doodling. And, when I mentioned it to Jack, he too embraced the idea, christening them “Doodles in Space”. It’s an amusing idea. However, the objects are not simply random doodles and they are not randomly assembled. As with traditional still life, each pedestal in the exhibition is a still life composition. Like traditional still life, there is a celebration of collecting and displaying things. Also, like traditional still life, there is symbolism embedded in many of the components of the composition. And, like traditional still life, there is a level of technical mastery. While the individual pieces can certainly stand-alone, the compositions are greater than their component parts. One cannot but hope that some curator will decide to give one or more of the collections the home that they deserve. This is Lauren DiCioccio’s third solo exhibition at Jack Fischer Gallery (49 Geary St., San Francisco). It will be on display through September 8th. There will be an Artist Reception this Saturday, August 11th from 3:00 – 5:00 pm. It is a great chance to meet a wonderfully articulate artist. For inquiries about her work, please contact Jack Fischer Gallery here.